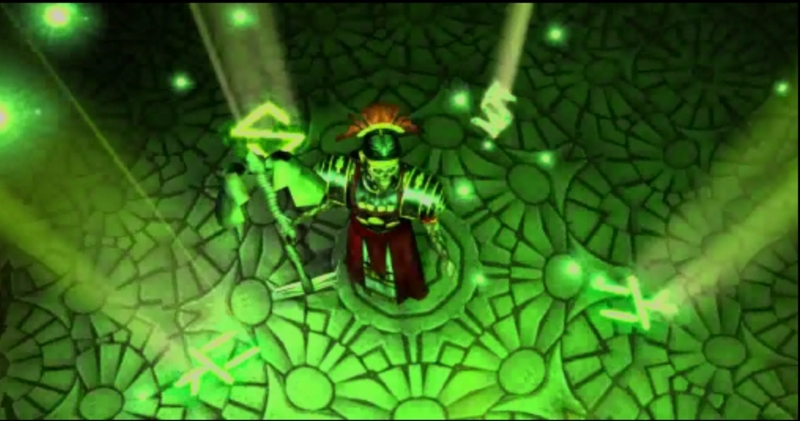 Eternal Darkness: Sanity's Requiem is a game that was developed by the Silicon Knights and published by Nintendo for the Gamecube. The Silicon Knights is a game programming company that operates in Canada. They have even received Government funding. That is kind of strange for a game programmer don't you think? Not if its a mind control experiment. I think just right off the bat, I noticed the Silicon Knights reminded me of the 'Knights Templar' as soon as I saw their logo, but we will come back to that later. First, let me give you a run down about what this game is about. This game is shrouded by a lot of mystery, and is named one of the most underrated Nintendo games of all time. It even appeared in Nintendo Power magazine as one of the top 200 games of all time. That is a pretty big achievement for any game publisher. This game is a psychological thriller and it features occult magick, undead zombies, and a diverse story line to immerse you deep into a dark and very evil world. The game is full of magical symbols, and magical incantations that are strange, and even more so when spoken aloud by a mysterious voice as the game does whenever you cast a spell. 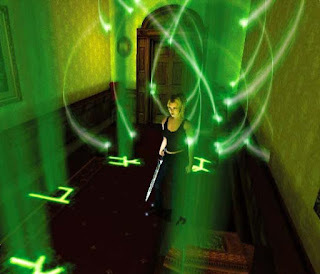 The game takes place inside a scary mansion on the outskirts of Rhode Island. You play a character named Alexandra Roivas who is called to the mansion that her grandfather owns, after he has been brutally murdered from within the mansion's walls. The police have no one to investigate so Alex is left to fend for her self. You explore the mansion at first with creepy sounds occurring all over the place, and weird screams of what sounds like tortured people that come booming through the speakers at random times to keep you nice and freaked out. In one of the hidden rooms of the mansion Alex stumbles upon a book that is bound in human flesh and bone called 'The Tome of Eternal Darkness'. Upon receiving the book Alex begins to read the book and the game suddenly shifts to you playing the role of Pious Augustus a Roman Centurion in 26 BC. You will notice that through out the game you take on multiple playable roles that tell the story of the Tome of Darkness and what Alex and her family has done, and must still do, to save the world from the Eternal Darkness. Could this game be based on true events? Everything is perfectly tracked through out a timeline in our human history, it very well could be a certain reproduction of events with its own spin to infiltrate the minds of players across the globe. Alex Roivas the main character in the game while investigating the death of her grandfather, she keeps finding more and more chapters hidden throughout the mansion. She keeps reading the book, and taking on the roles of the pawns throughout history that have combated the darkness. Along the way Alex learns a very occult magick system ruled by magical sygils, codexes, and runes or (symbols). This is the same thing used in modern day witchcraft, and occult practices to inflict magical intention through-out this world. Some of the groups that use this knowledge are The Order of the Golden Dawn, OTO, and other secret mystery schools. In these screenshots you can see the specific symbols used in a secret ritual like magic that is used to summon what the game calls an "Ancient". 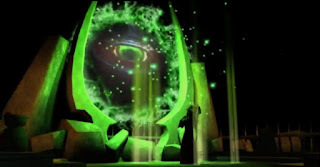 An 'ancient' (as described by the game) is a made-up deity that could represent any one of the real worshiped deitys from any pagan religion, cult, or any other secret society like the Knights Templar. The Knights Templar were said to perform a ritual that would allow them to speak with a severed head and converse with the spirits. In the last screenshot you can even see the two pillars symbolic of freemasonry 'Bachin', and 'Joaz', along with the all-seeing-eye. The Knights Templar were deeply involved in the creation of the secret fraternity of the Freemasons. There is a secret that is not so well known about the game Eternal Darkness. Their is a hidden chapter in the Tome of Eternal Darkness that would have allowed the player to play as an actual member of the Knights Templar named Joseph De Molay. This is proven fact, and is straight from Denis Dyack's (the game's creator) mouth. Don't believe me? Just check out the Wikipedia page for Eternal Darkness, I will include a link at the bottom of this article. Why was this removed from the final cut of the game? Was it because Denis Dyack thought that it may be too much to use a real Knights Templar in the game because that would connect the dots too much? I think so. After all if the Knights Templar did exist today through a secret fraternity such as the Freemasons using a game publishing company called Silicon Knights, they definitely don't want to be using any real names. Joseph De Molay was a Knight Templar that was slowly burned at the stake, and turned to ashes. Probably one of the worst ways to die. Before Joseph died he cursed both the Pope and King Charlemagne of France, and both shortly after died horrible deaths. If anyone else has played this game, and has anything else to add, then please feel free to leave a comment about it. I have tried to uncover most of the secrets that I can, and I even beat the game again so that I could get the screenshots for this article, I hope I have opened your eyes to some of the secrets of this bizarre video game. Occult teachings from many different books speak about the power of reverse. The Book of the Law by Aleister Crowley even mentions learning to do things in reverse, even to speak and think in reverse. One last note that I will leave you with is that the main characters of the game "The Roivas Family" is 'Savior' backwards or in reverse. This is a very odd story to say the least. Regardless, what really gets me about this whole thing is that the Canadian government would have anything to do with any type of video game. This is what raises questions in my mind. For what purpose would they have a reason to fund a video game, especially one based on this premise? To me, this is worthy of further research. Thanks for the story Ray. Very good point Tony. I find that very strange too. I can see how a government would want to fund games and publishers to enlist people in the military like "Medal of Honor" however, games of this subject just make it even that much more weird. Thanks for reading. On second thought, and after a bit more research, the Canadian government has been funding games for quite some time in an effort to bring more business to Canada. It has worked too, because it ended up bringing EA Sports and other well known developers to Canada. The fund that sponsored games such as the one above has also awarded grant money to games with shall we say, less of a controversial premise. They have been doing it for the last 3 years and award developers anywhere from 30k to one even getting $536K for their title. So I don't think, after deeper thought and more reading, that there is any conspiracy involved with this particular game and it's funding source. Although the game itself is a bit of a strange one. Maybe chalk it up to writers who really did their homework and provided a backstory worthy of more than a mere Gamecube title? Either way, very interesting read. Just wanted to point out what I had learned. Thanks for pointing that out. I wonder if the Silicon Knights have any more connections with the Knights Templar....Thanks for your input, that makes a lot more sense now, this game is definitely one of a kind. Well, we can always wonder. That's what makes "conspiracy" so intriguing is it not? I tend to think that most times, popular names are just borrowed simply because of that connection to history or conspiracy. But then again, it is when people get too complacent and think that way that something happens to prove us wrong and then no one was prepared for whatever the end result is. So that said, we should always consider "anything is possible".